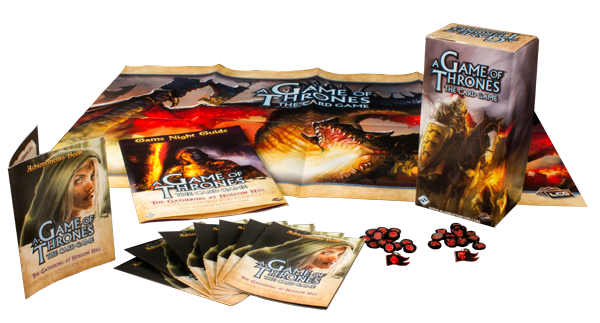 It's time to call the banners and prepare for war and intrigue with Game Night Kits for A Game of Thrones: The Card Game. The Winter 2011 Game Night Kits are now on sale, so begin your plans to host a league of your own! For those unfamiliar with Game Nights, here is a summary of what you can expect. The organizer will set a certain time and day of the week for their Game Night. On the first night you'll receive your achievement card to track your progress. Although there are official tournament rules for all of our LCGs, it comes down to the local player community and the organizer to determine the limitations and ground rules of a Game Night. The season generally lasts 6 weeks, at the end of which the winner is determined and the prizes from the Game Night Kit are awarded. 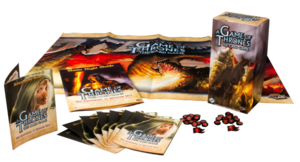 Fight your way to the Iron Throne in a league of organized play dedicated to the LCG set in George R.R. Martin's vibrant world of A Song of Ice and Fire. The guidebooks in the kits contain all the information on how to get your Game Night started, how to run tournaments, and most important of all, explains the new achievements. Achievements give players of all experience levels in-game objectives from the simple to the nearly impossible that offer diverse new ways to approach and enjoy Living Card Games.